How to add a custom field? Custom fields are designed for recording of any additional data in the cards of accounts, transactions, projects and other Flowlu modules and applications. For example, in the opportunity, you can display fields for specifying special conditions for the customer, discounts, information about the delivery – address, desired time, contact phone number, etc. In the task – a field for specifying the cost. In the project – a field for specifying suppliers, contractors or external executors from CRM. To set up and display the user fields in the modules, you do not need any technical skills. This is done quickly and easily. 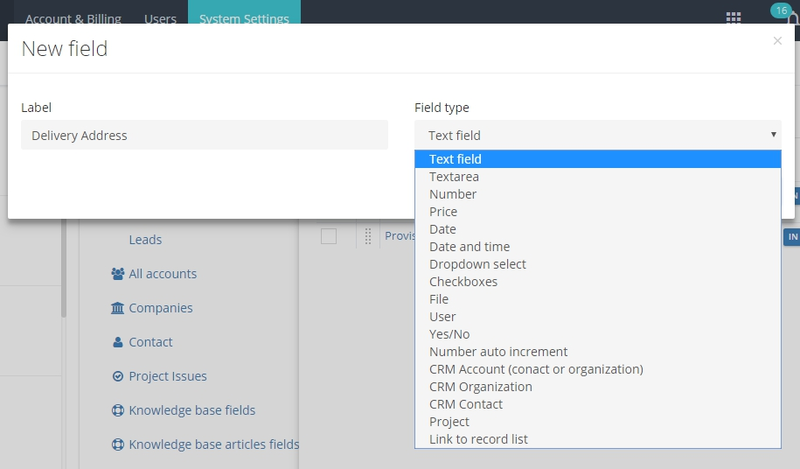 1.Go to the "System Settings" (1) → "Custom fields" → "Main Settings" (2) → "General" (3) and select the module, for which you need to add the custom field. 3. Name it and choose the type. 4. Save the added field. Then go to its settings, by clicking on its name, and specify the necessary settings. For all available settings for each field, see below.